This small, lightweight, highly efficient unit was designed in our USA laboratories and manufactured in our HK facility. It is intended for field chargers, ion supplies, plasma power sources, hand held rail and coil guns, anti gravity, ozone, air purification and other small high voltage applications requiring 12 volt input. See the download, below, for the wiring diagram and example schematics that use the transformer. Volume discounts are readily available. Contact us for pricing on quantities over 10,000 pieces. 4000 volt pk model at 15ma, 20kHz-100kHz operating frequency. 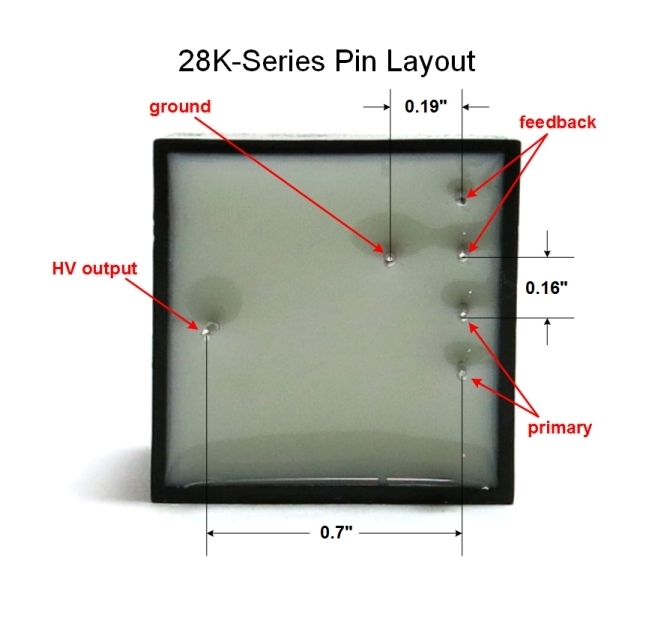 Similar to 28K089 in construction, in 1 x 1 x 1" potted enclosure with PC board pins. Click the button below to add the Miniature Ferrite High Frequency Transformer 4kv 15ma 20k-100kHz to your wish list.